Bushnell ET2164 Elite 2.6-16x42 Mil Dot Tactical Riflescope ET2164 FREE SHIPPING! The Bushnell Elite 2.6-16x42 riflescope is a versatile addition to their flagship Elite 6500 family. It provides rapid target engagement at short ranges while also offering accurate distance shooting thanks to its precise windage and elevation tactical turret controls. Its premium multi-coated optics feature an individually-calibrated Ultra Wide Band Coating on each lens surface for enhanced light transmission across the visual spectrum, providing a bright, high-resolution image. External lens surfaces also include a Rainguard HD coating that breaks up water droplets to maintain visibility in the rain. 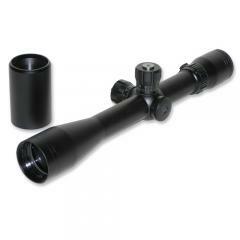 The scope's durable aluminum tube is recoil resistant and filled with argon to keep out water and prevent fogging. ©2002-2019 CopsPlus.com: Bushnell ET2164 Elite 2.6-16x42 Mil Dot Tactical Riflescope ET2164 FREE SHIPPING!